Coca-Cola's Australian-based bottler Coca-Cola Amatil is systematically violating basic rights in an effort to stamp out independent and democratic trade unions at its Indonesian operations. And Coca-Cola corporate management in the US knows the full history but has failed to remedy the abuses. In March 2015, Coca-Cola workers in the Jakarta - Cibitung area in West Java began organizing an independent union, the SBCCD, which was legally registered in May. Management responded by harassing members and taking disciplinary action against the leaders. Union chairman Atra Narwanto was suspended - the prelude to dismissal - on June 30, 2015 in a procedure which egregiously violated basic legal requirements and due process. In December 2015, the local Labour Office issued a recommendation for immediate reinstatement. Coca-Cola management rejected the recommendation and brought the case to the higher Industrial Court, employing the services of a notorious union-busting legal firm. The Court ruled for termination on October 5, 2016. Local management has rejected the union's request for collective bargaining negotiations, and insists on barring Narwanto from union-management meetings, despite the fact that he remains the elected union chairman. Amatil management reacted with similar brutality when Coca-Cola workers in Bawen (Central Java) began organizing an independent union, the SBMCC, in November 2016. The union was legally registered on February 9, 2017, and held its first general assembly on February 18, electing Lutfi Arifiyanto as chairman. Three days later, Arifiyanto was transferred to a workplace 170 kilometers away. Three days after this, he was issued an alleged 'second warning letter' without having received a first. And on March 16 he was informed that he was terminated, effective April 1. The IUF has repeatedly called on Amatil management at all levels and the Coca-Cola Company in the US to remedy these blatantly anti-union practices. There has been no positive response from either company. Coca-Cola Amatil is the sole bottler of Coca-Cola products in Australia, New Zealand, Indonesia, Papua New Guinea, Fiji and Samoa. The Coca-Cola Company headquartered in the United States holds a 29% share in Coca-Cola Amatil, licenses its brands to Amatil and supplies the proprietary concentrate. 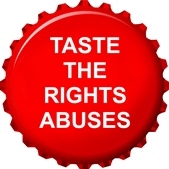 The Coca-Cola Company bears responsibility for what goes on inside the Coca-Cola system. USE THE FORM BELOW TO SEND A MESSAGE to The Coca-Cola Company in the US, telling them to act to ensure that the two dismissed union leaders are immediately reinstated, the company stops harassing and victimizing union leaders and enters into good faith collective bargaining negotiations with the independent and democratic unions working with the IUF at Indonesian facilities.